4A Roofing your premium roofer. This project was managed by Dain. Please read our reviews available on the Better Business Bureau. 4A Roofing, LLC. is premium restoration and roofing company in Kansas City, MO. We specialize in all roofing systems doing both commercial or residential applications. We go the extra mile offering our customers peace of mind throughout the restoration process. We provide free written estimates, free damage assessment reports, and offer quality workmanship backed by a 5 year water tight guarantee. We can use all manufacturer recommended components while following required local building codes. We are clean, organized, and efficient. All of our installers follow strict protocol on all of our restoration projects. If you have a particular style or a specific product you would like us to install, feel free to call we do custom roofs as well as working with any type of roofing material. We use tarps to protect your property during the construction phase. Being prepared is the key. We care about your property. We cover your foilage, A/C unit, walkways, and back patios where applicable. We clean throughout the installation and once the project is complete your project manager will come again and sweep for nails. All of our limited/lifetime roofing systems are backed by a 5 year workmanship warranty. We do not collect the first check until the work is complete*. If your damages are covered by insurance we do all the necessary filing, invoicing, supplements, and handle all mortgage company stipulations. *For Insurance jobs. Retail projects require 50% payment at delivery of materials and remainder due upon completion. Roof Decking - OSB Replacement: 2 Free sheets of OSB are included with each 4 A Roofing project. We include the labor to remove and replace up to 2 sheets at no cost to you. GAF Armor Shield 2 is a Class 4 impact resistant shingle proving protection against hail stones up to 2 inches in diameter. 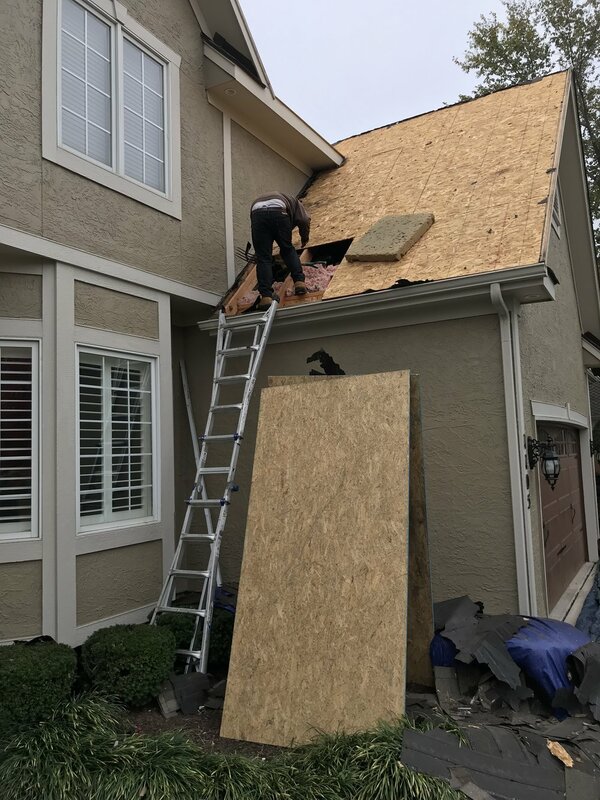 Also the Class 4 rating offers discounts at many top insurance carriers of up to 30% off your premium, Please contact your insurance agent to verify the discount that you qualify for by using a impact resistant Class 4 shingle on your home. We use additional vapor barriers on all jobs to prevent ice damming on the eaves and where snow collects in the valleys. We do not just apply to the perimeter we apply it correctly covering your eaves continuing 2 ft..past the interior heated wall. After- project managed by Dain. We do rooftop delivery on all of our projects.to avoid any undue inconvenience to the homeowner. Or fill out the form below and someone will be in contact with you as soon as possible. Roofing Siding and Gutters. All types of Roofing serviced both commercial and residential. GAF certified in Kansas & Missouri. Providing you with quality roofing systems.